Microsoft lays claim to the most advanced tracking technology in the world (for mice, at least), the Microsoft BlueTrack Technology. What’s so special about this, you ask? Well, it enables consumers to take use their mice just about anywhere they like without worrying about the type of surface. This makes me remember of the good old days when owning a mousepad factory was still profitable – optical and laser technology have since advanced pretty far, although laser still doesn’t do glass. This is where BlueTrack comes in handy – it offers the precision of laser tracking on just about any surface, ranging from a granite kitchen countertop to the living room carpet. As to why you’re mousing on either surface, I suppose that’s something only you can explain. According to Microsoft, their BlueTrack Technology works on more surfaces than both optical and laser mice. The main reason behind this? A large, blue beam and specular optics architecture that works in tandem with a Microsoft-designed image sensor and proprietary pixel geometry which will generate a high-contrast picture of the mousing surface for exceptional tracking accuracy. The BlueTrack Technology light beam emanates from the mouse’s bottom, which is four times larger compared to the average laser beam found in today’s mice. This makes it much easier to track despite using it on difficult (and a strange choice of surface, I might add) terrain. You will find BlueTrack Technology in two new high-end Microsoft mice this autumn – the desktop-friendly Explorer Mouse and a smaller version known as the Explorer Mini Mouse which targets the notebook crowd. The 2.4GHz wireless technology used will work fine as long as you remain within a 30-foot radius, although you’d got to have a pretty huge display if you’re going to use it anything further than that away from your screen. 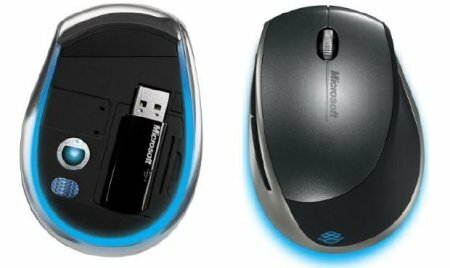 The Explorer Mouse with BlueTrack Technology and the Explorer Mini Mouse with BlueTrack Technology will retail for $99.95 and $79.95, respectively.